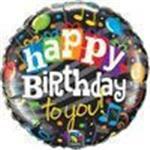 We have a huge selection of birthday balloons in latex and mylar styles to suit the most discriminating shopper. Click on either of these images to view your choice of amazing balloons in either style. For ideas on how the balloons appear in a balloon bouquet, click on our "Balloon Bouquets and Deliveries" menu tab to see how delightful bouquets are created from a variety of single styles.